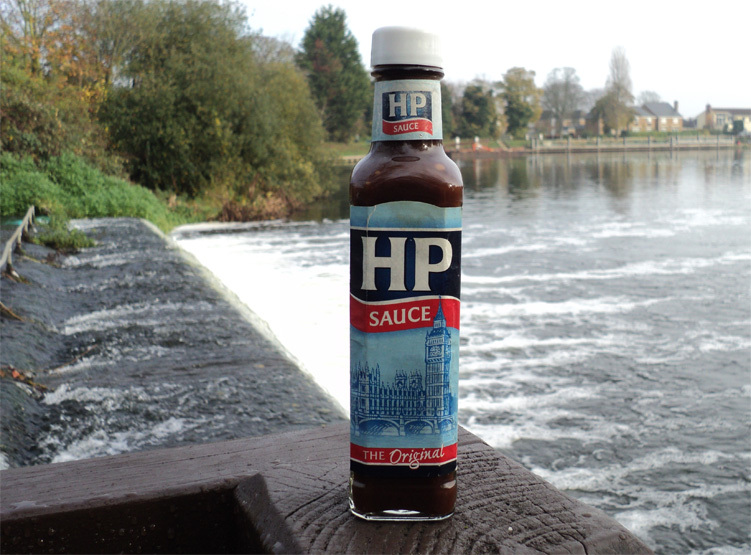 And we remembered the brown sauce! Another trip to Penton Hook yesterday and as Darren is away on holiday Dan and myself decided on a much more leisurely start time of 10am... Still meant getting up at eight, but we could do most of the journey on trains, bike riding was minimal! A simple set up of 3oz ledger, bead, swivel, wire trace and single barbless treble hook. And a choice of small roach or sprat deadbait. 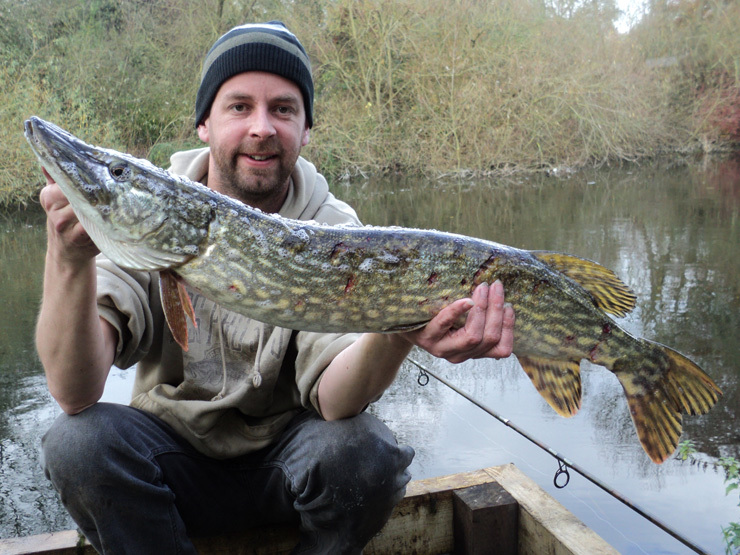 The plan was to spend about half an hour in each swim until we found a pike. The first spot looked devoid of life so we moved and fished against far side features. It wasn't long before I had a run on dead roach and a 4lb 0oz pike. 4lb pike on ledgered roach, a pike before breakfast, great! 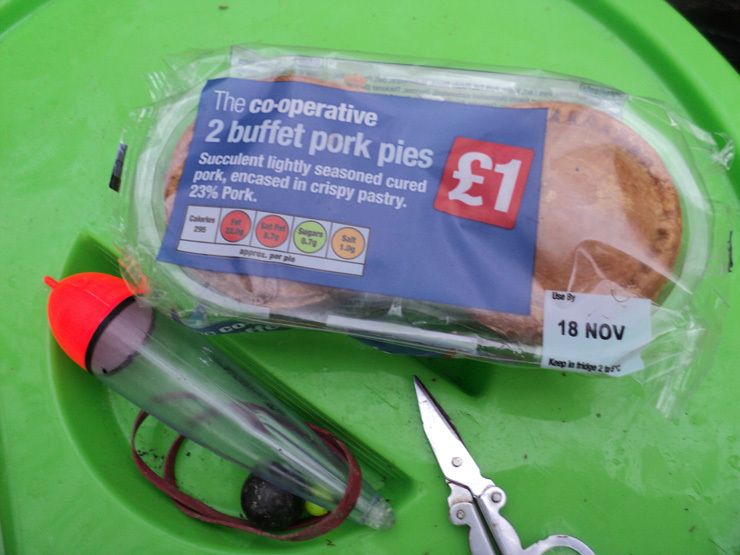 With a pike already banked Dan started on the sausage sandwiches, you can't beat sausage sandwiches and pike fishing, a natural combination! The cook. Beers were for later, not for breakfast. 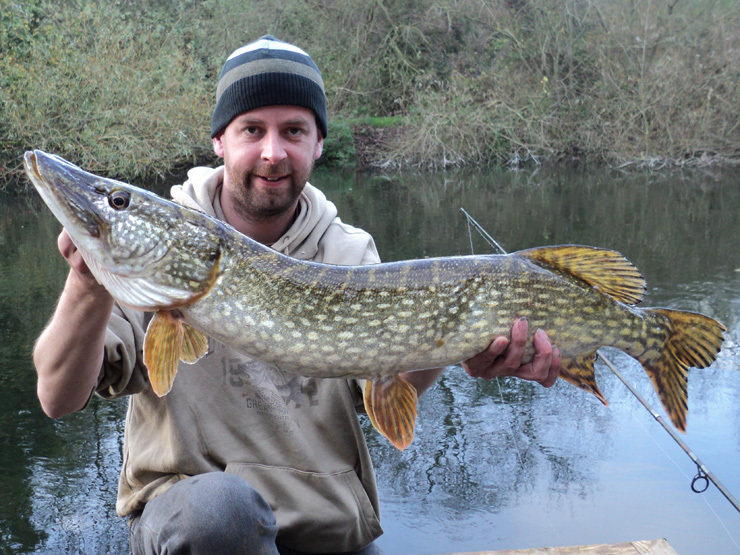 Another run and a pike on, this one went right up the river in big strong runs. The water is perfectly clear so you can see the pike almost instantly, I got the pike right to the net before she shook her head and spat the hook. Looked about 8lb, would have been a Thames PB. Next cast and I had an instant run. I winched the fish half way across the river before she knew she was hooked, I thought there wasn't going to be any fight at all, but it looked like a twenty so I was eager to get her in the net. Then she woke up and put up a cracking fight, this fish ran downstream and made 2 hundred foot runs and found a snag twice. After some heart stopping moments I got her over the net. The net wasn't really big enough but somehow Dan got her in there - gold star for Dan. He then picked the net straight up breaking the net pole - remove Dan's gold star! The pike had a massive head and a long skinny body and went 17lb 12oz, but judging from the length she'll be a 20 by March, I hope to see her again then. My first Thames double - fantastic! A long lean 17lb 12oz pike on ledgered sprat. A new sprat was cast across, and much to Dan's disbelief another instant run. 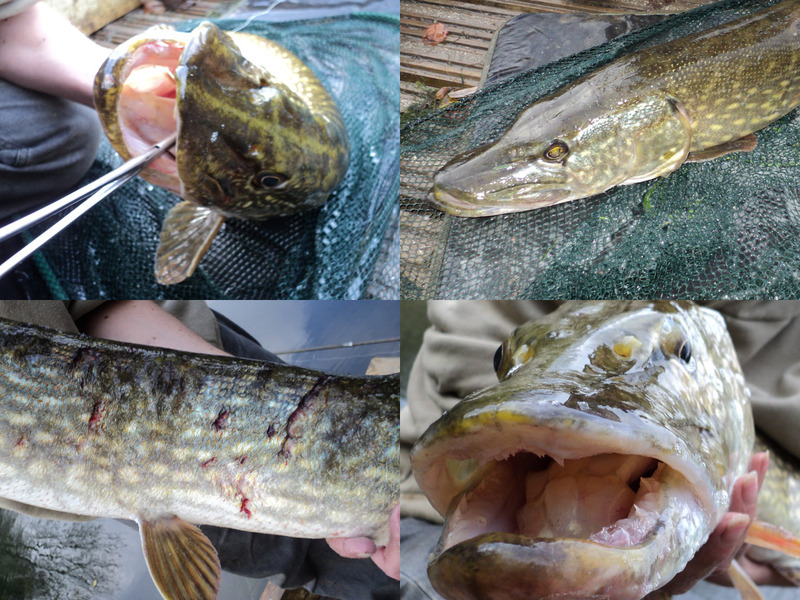 Not much of a fight except for briefly hitting a snag, or so I thought, when I got her in there were tooth marks where she'd been grabbed by a larger pike. 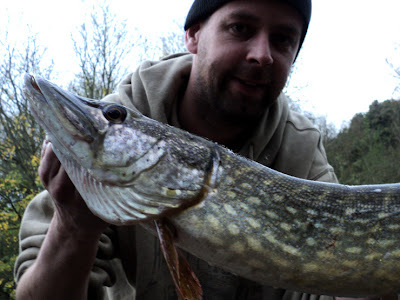 The pike went 8lb 8oz, I'd like to meet the one that grabbed it! 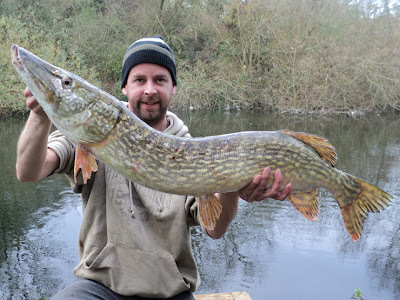 8lb 8oz pike, lucky escape with a few tooth marks. Dan was fishing exactly the same set-up as me, bait was from the same batch of sprats and the baits were fairly close together but all the runs were on my rod. Fishing is weird like that sometimes. I did bring a second rod to catch some livebaits should the deadbaits be ignored, but we both decided to stick to the deadbaits. So I put on a ledger and we took it in turns to fish against features. I was first into the action, hooking and loosing what must have been a barbel (although we didn't see it). Dan was next up and we're pretty sure he hooked a carp, again we didn't see it. Everything seemed to be feeding today. Dan wrapped up the ledgering with a gudgeon - but neither of us fancied it for livebait - lucky day. My pike rod was away again and a tail walking, acrobatic 7lb 0oz pike was landed. A really beautiful green and gold fish on a sprat. 7lb 0oz, pike number four. 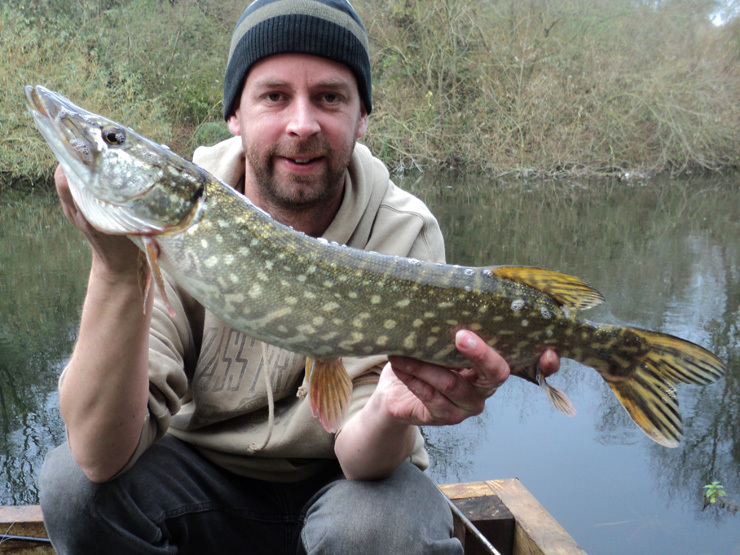 Another sprat was cast back to the same spot and a pike picked it up on-the-drop. I winched it half way towards me before it woke up and shot down the river, eventually finding a snag. It was stuck, I put the bait runner on waited for it to swim out, when it did I wound down and the fish went straight back into the snag - and they say they're stupid! I eventually got it to the net and it went 11lb exactly, two doubles! 11lb 0oz, second Thames double. Another run, yeah on my rod, this time on ledgered roach (we were running low on sprats). 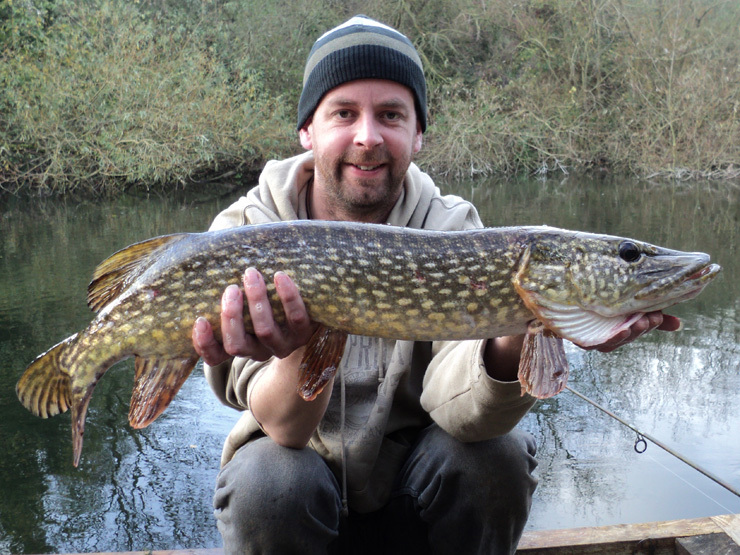 And my sixth pike of the session went 7lb 11oz. Sorry Dan. 7lb 11oz, my tenth Thames pike. Additional photos by Dan (click to enlarge). Sounds like a great day where the weather has helped the feeding - the 17lber really is a bighead (markedly so) and will definitely do 20+ come early spring. How does your Thames piking experience compare to the Wye (excepting that south west London isn't quite the Golden Valley of course)? What a superb session Brian,looks like a very eventful trip and that 17 is a beauty. Wow, what a great session. It's very strange why Dan wasn't getting any runs. I have a theory, Dan had probably gotten something on his hands before fishing. Maybe a chemical of some kind (hair gel, petrol or even something from the stove you were using to cook the bangers with). 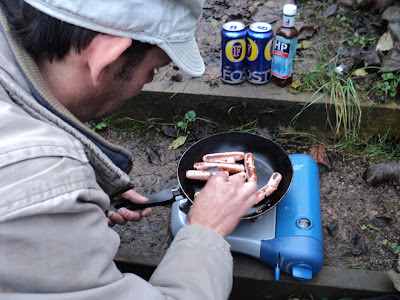 I have discovered over here that you will be sat watching others catch the fish if you have put fuel in your car, used a cleaner (on your hands or near your gear) or even used heavily scented soap before fishing. If the same thing happens again the person doing the catching should do all the baiting up. It's just a theory, but seems to be true over here. 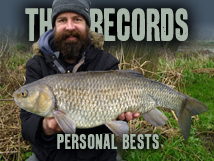 Cracking session you had there, some great fish. KB, Thames piking is great, now I'm beginning to get a grip on it. But Wye piking is so exciting because it takes me back to being twelve (when I started). If it had to be only one river forever it'd be the Wye. Mark, cheers - bit of a red-letter day, next time I'll find out if I'm starting to locate them or if it was just a fluke. Jane, 'queuing up for me' I wish! Paulos, I was waiting for your comment, it was breaking my head the 7-0 runs, but I think you might be right - it can't be just chance with those numbers. Next time we'll try the catcher doing all the baiting up. Stu, Cheers, I've sent you an email. I'd be with in opting for the Wye. 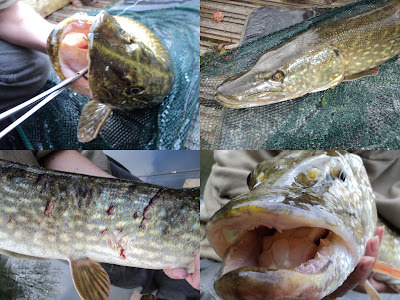 I'd also confess to small rivers being a current favourite, particularly in colder months but not really for Pike: if you discount a lost fish (of about 8lbs - it seemed bigger at the time) when I was about fourteen*, I've never even attempted piking on small rivers. Maybe I've become an aesthete but Pike venues matter and on a significant scale. In this sense, I'd swap a forty from the vast expense of a trout reservoir (or even a certain lake in North Yorkshire) for a thirty from Blenheim or the same from the Wye. History and location play their part but with river piking there's something more abstract and less tangible. I've often thought of the Wye as something of a secret. One of our great rivers but largely unknown to most, partly as a product of geography - latterly at least, some of that's changed, although it's still special. Having fished both the Severn and the Trent (but never the Thames) quite extensively way back when, neither are remotely comparable. The Vyrnwy is interesting - though never one that meets a 'big' river descriptor - and I've often wondered at the potential of the Eden (a beautiful river which instinctively looks to have the scope for big Pike but has very little history: it's definitely done fish into the high 20s though finding resources is patchy given the dominance of game). 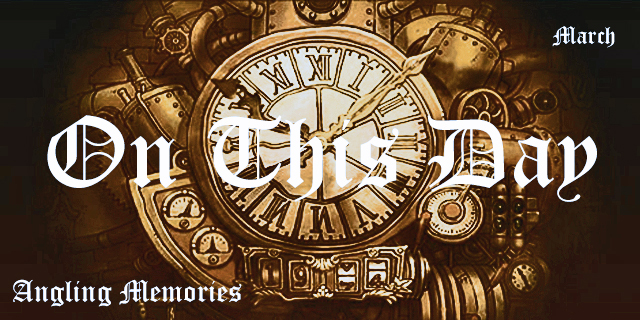 * When strangely enough, I was pretty much certain I'd be a graphic designer. It turned out that I was wrong though!